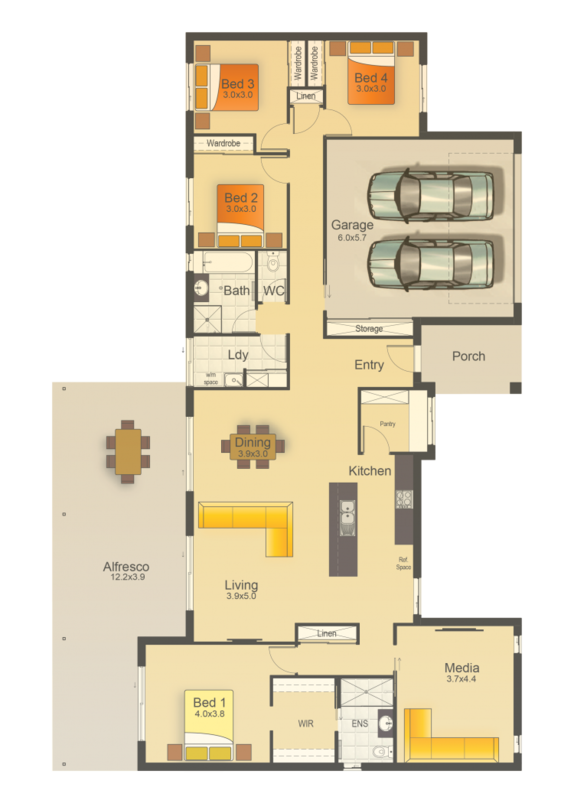 The Rosewood 268 encompasses everything about the ultimate Queensland Lifestyle and living. From start to finish, this design has the ultimate space, functionality and contemporary feel in mind to suit anyone wanting to build their dream home! From the entrance, you are greeted by the large galley designer kitchen with ease of access to the living and dining space. The outdoor alfresco follows through which bring the outdoors in to provide a fresh, clean lifestyle for you and your family. The Master suite has its own private wing with a media room to the rear. This creates your very own private retreat feel! Over the opposite side of the layout we have our bedroom and services wing which houses the remaining bedrooms and main bathroom.